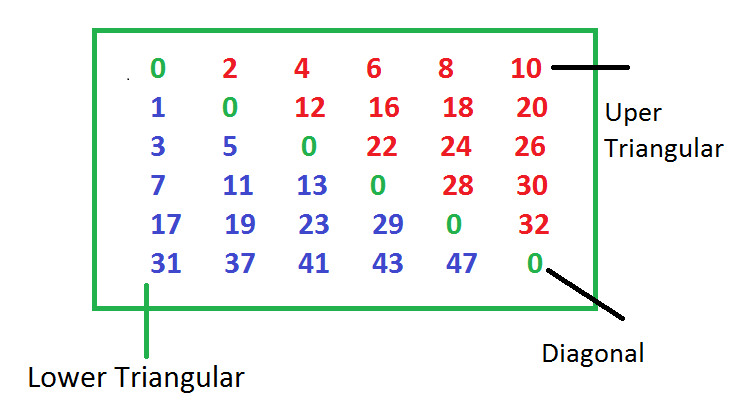 How to print an Even Numbers in Upper Triangular of a matrix and Odd Numbers in Lower Triangular of a Matrix and top-left to bottom-right diagonal should be zero. In this programming problem, we have to perform multiple tasks, we need to implement a multiple logic Here is the list of the task we have to perform while solving this problem. This below pic explain everything in a simple language. See this image carefully you will get all the picture of the pattern problem in Java language. You can see that I have colored all three part for clarifying the problem in an easy way, Here you can see that the Upper Triangular with red color and Lower triangular with Blue color and a diagonal with Green color. So Now we got the problem we have to now find the solution by applying the above 3 programming logic. Before starting let again take a look in a simple way. 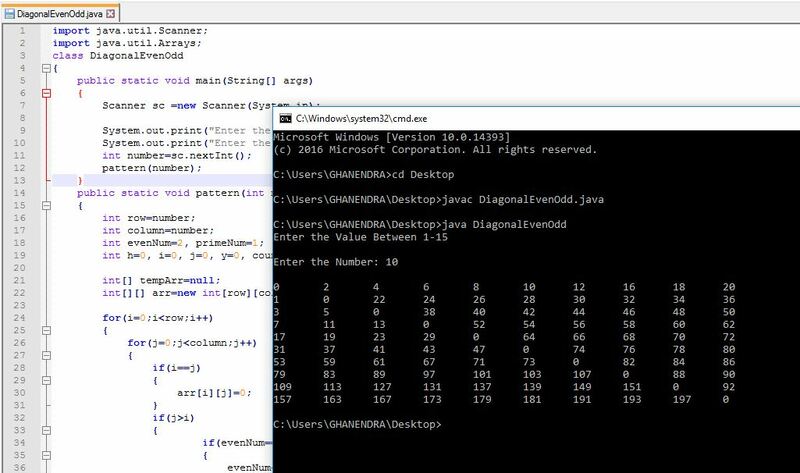 Here is a complete solution up to 18 digit number, this program can go up to any number of for better viewing output in a console screen I suggest use only up to 15 number. You can increase a limit by updating the value of an array(Increase the size of an array).